I did this walk on Sunday 6th February, immediately after finishing stage 7. From the end of stage 7 I made my way down King John's Walk, following the route of stage 6 up to Mottingham Lane, which as well as marking the end of stage 6, also marks the start of both stages 8 and 9. 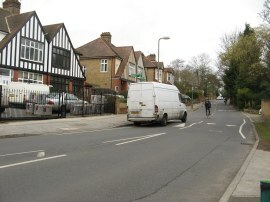 Stage 8 then heads gently uphill along Mottingham Lane, photo 1, before heading down a narrow fence footpath on the left with the playing fields of Eltham College to the left of the path and paddocks on the right. 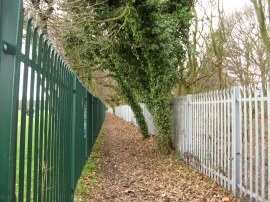 The path follows its fence lined enclosure, photo2, eventually bending round to reach the river Quaggy which runs in a concrete channel to the right of the path close to the club house and car park of the playing fields. Heading down the driveway that leads to the playing fields the route reaches Marvels Road where once again the Green Chain Walk splits up. Here the main route heading to the right along the road and a spur, which links up with route 9 near Elmstead Woods, continuing ahead across the road along a footpath running alongside the Quaggy and it is this spur that I took first. This footpath is followed between houses to the B226 Chinbrook Road where the route continues ahead into Chinbrook Meadows, photo 3. 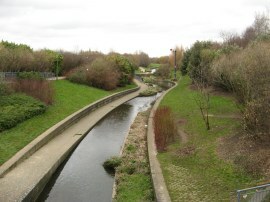 Here the route heads along a path running through the park past a small area of meadows formed by the River Quaggy, which is a tributary of the Ravensbourne. Originally this area of the river here was also in a concrete channel similar to that passed earlier however in the early 2000s the concrete channel with its fences and hedges was demolished and river was remodelled to give a natural, meandering appearance which was very pleasant and unexpected to walk alongside. 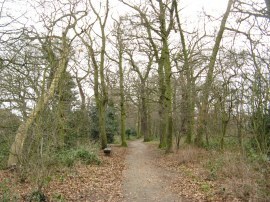 The path heads by a number of football fields and then some tennis courts to reach some railway lines running along an embankment high above the right hand edge of the park. Here the route then joins a slightly muddy path that heads uphill over grass parallel to the railway lines. Leaving the park after a short sharp climb uphill, with the railway lines now running in a cutting below the path, the route heads through a metal gate and along a narrow tarmac path. To the left of this path a new path, photo 4, was in the process of being constructed although only a short stretch is currently useable. 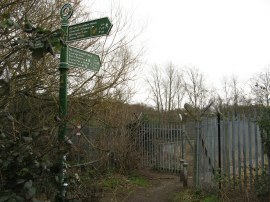 This path is followed alongside the railway tracks up to a footbridge over the rail lines which marks the point where the route of this spur from stage 8 meets up with the main route of stage 9, photo 5. As usual, having walked this spur, I then turned round and retraced my steps back to rejoin the main course of route 8. 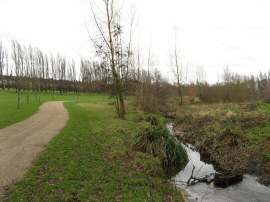 Chinbrook Meadows was a very attractive open space which my photos didn’t really do justice too. I stopped for a short snack break on a bench in the park before continuing back to Marvels Road. Reaching the main route back at the road a finger post said it was 3 miles to Beckenham Place Park which is near where stage 8 ends. A section of road walking then follows as the route then follows Marvels Lane uphill and bends to the right to briefly join Somertree Lane before heading to the left up Coopers Lane, photo 6. Reaching the end of the road the route heads to the right along Baring Road before heading downhill along Railway Children Walk. This is followed down to the edge of Grove Park Nature Reserve, where there were some snowdrops in flower, before taking an enclosed metal footbridge over some railway lines, photo 7, not far from Grove Park station. 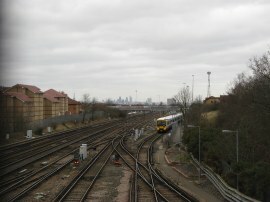 From the railway bridge there were good views down towards the City of London as well as over Hither Green Cemetery to the right. Once over the railway lines the route heads over a patch of open ground and continues ahead along Reigate Road, passing a childrens play area and then Downham Fire Station which seemed to be strangely located in the predominantly residential street. Reaching the end of the road the route crosses Northover and continues ahead along Whitefoot Terrace. The path then heads up to the left along Woodbank Road before heading to the right along Undershaw Road, photo 8, another road with an unusual broad grass and tree lined central reservation. 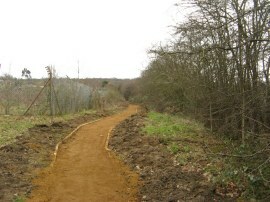 From Undershaw Road the path heads into the Downham Woodland Walk, photo 9. 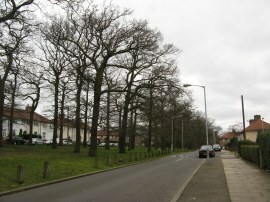 This small strip of tree lined green space runs between houses for some distance, crossing a number of minor roads in the process as the route makes its way along to the A21 Bromley Road by its junction with Oakridge Road. 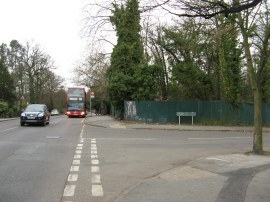 The Green Chain Walk crosses over both roads and continues on down Old Bromley Road. Just past the junction with Bangboune Road the route heads to the right along a broad section of path with brick built flats on the right which leads into the grounds of Beckenham Place Park. 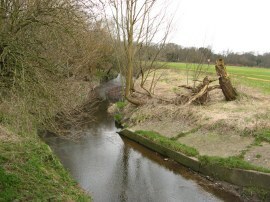 Here the path crosses over the River Ravensbourne, photo 10 and continues ahead along a tarmac path running along the bottom edge of some open ground. 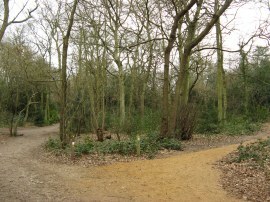 After a while marker posts direct the route off to the left along a track that crosses over a railway line and heads into a more wooded area of the park, The route then winds its way through the trees up to a junction of paths where the Green Chain Walk splits into two, photo 11, the main path on the right heading on to go up a few steps while the alternative path on the left gives step free access up the gentle slope. 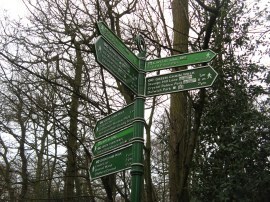 I quickly walked up the left hand path before retracing my steps once again to take the right hand path as it heads uphill through the trees to reach a marker post, photo 12, which as well as marking the spot where the two routes meet up is also the end point of stage 9 of the Green Chain Walk. 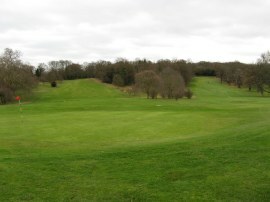 The route then heads downhill alongside the fairways of Beckenham Place Park Golf Course, photo 13, eventually joining a tarmac path which bends its way uphill through more open ground towards the Beckenham Place Park Mansion, photo 14. Approaching the mansion house the route heads up to the right and crosses over the car park before joining another paved stretch of footpath that heads round the edge of an open space before passing through a small band of trees to reach the A2015 Southend Road. Heading to the left along the road the route soon reaches the junction with Stumps Hill Lane, photo 15, which marks the end of stage 8 of the Green Chain Walk. 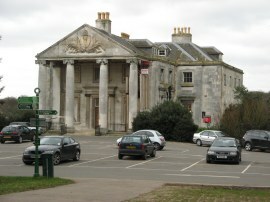 The direct length of this stage is about 5.5 miles but with my additional walk there and back through Chinbrook Meadows along the link path to stage 9 and the short alternative route in Beckenham Place Park I had walked a total distance of 6.7 miles on the stage. 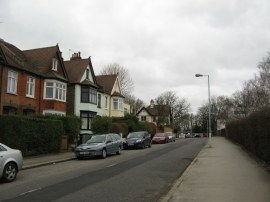 I then headed down Stumps Hill Lane before heading to the right along Worsley Bridge Road. Leaving this road, I then took a rather circuitous route down to Stanton Way where I linked up with the route of the Waterlink Way. I then followed this footpath and cycle track, photo 16, first running alongside the River Pool and then the Ravensbourne, down to Catford Bridge station. From there I caught the train back to Falconwood Station which required a change of trains at Lewisham. Reaching Catford Bridge station I had walked a total distance of 15.0 miles for the day. I have uploaded the route of the days walk, including stage 8 which can be accessed here Green Chain Walk Sections 7 and 8 Route . Apart from the link path to stage 9 this section of the Green Chain Walk shares its route with the Capital Ring for its entire length so there was not much of the route I hadn't walked before. However I have made good progress along the path and with one more long day I should be able to finish the entire route. The Waterlink Way, which primarily seems to be a cycle path, was an unexpected find at the end of the day and the stretch I walked down besides the rivers was very pleasant. I had originally been going to head back from Lower Sydenham Station but was pleased I decided to walk a bit further.